There are no more Magic Johnsons in college basketball. That has been my thought the past decade while watching one-and-done college prospects follow each other like lemmings to the same two schools, Duke or Kentucky. Their paths are considered the easiest to an NCAA title, even though Kentucky hasn’t won since 2012 and Duke since 2015. The sobering belief was reinforced a year ago when Duke freshman Zion Williamson picked the Blue Devils over Clemson down the road from his hometown of Spartanburg, S.C. He previously had been thought to be a Clemson lean. His step-father hoped he’d play for the Tigers. Instead he joined two other committed lottery picks, R.J. Barrett and Cam Reddish, and another possible one-and-done, Tre Jones. Stacking teams goes against a basketball player's youthful days following the playground principles of balancing the sides, although admittedly college kids are copying what's happening in the NBA. Playing for your community as a bygone era has dipped to the high school level, too. Kids transfer to play with a friend or to an academy. 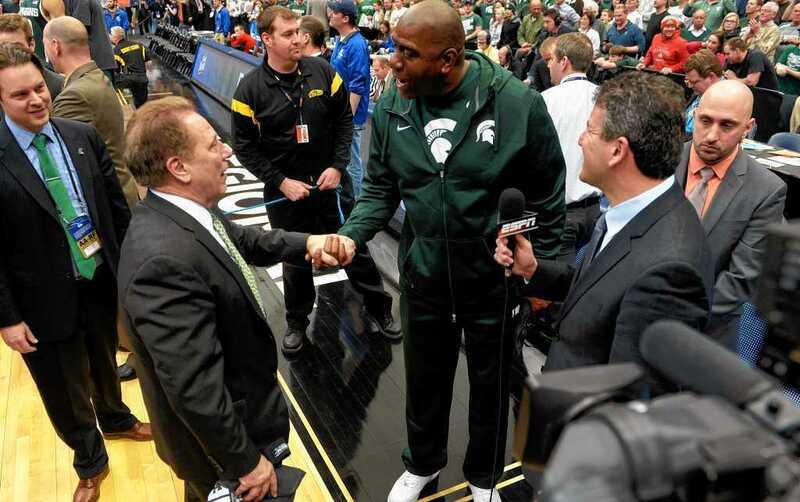 An old-school picture of Earvin "Magic" Johnson -- his Michigan State identity -- was reinforced over the past weekend when he returned to the East Lansing campus to celebrate the 40th anniversary of the Spartans’ 1979 NCAA title. 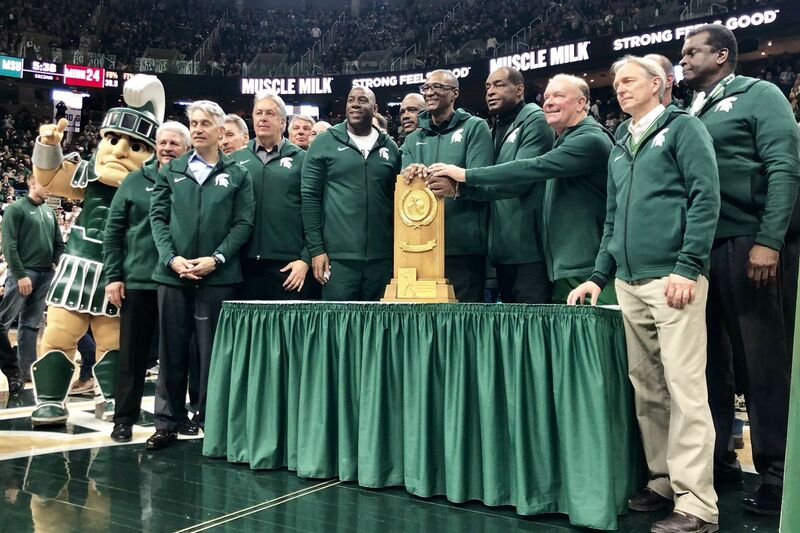 The events with his old teammates were mixed around this year’s Spartans beating Minnesota last Saturday at the Breslin Center, where a statue of Johnson greets fans on the plaza. Then he delivered as a sophomore, out-dueling Larry Bird in their famous NCAA championship game in Salt Lake City. To this day, that chapter of the Magic-Bird rivalry that continued in the NBA remains the most watched game in college basketball history. But two days after Johnson, Gregory Kelser and their 1978-79 season teammates reveled in anniversary ceremonies, something refreshing happened on the national recruiting circuit. Anthony Edwards surprised college basketball with a commitment close to home, Georgia. 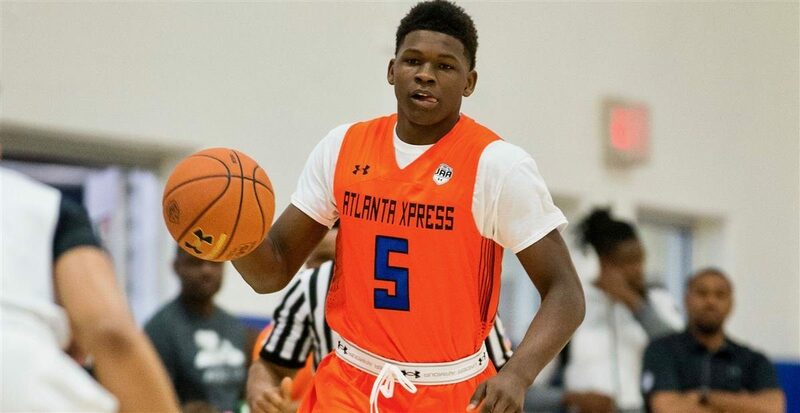 The 5-star guard prospect from Atlanta’s Holy Spirit was ranked among the top five in the Class of 2019 after he reclassified from 2020. He is Georgia’s highest ranked recruit despite the Bulldogs rebuilding their program under first-year coach Tom Crean, a former Michigan State assistant under Tom Izzo; Crean has his own Final Four credentials at Marquette coaching Dwyane Wade. Home weighed so heavily in Edwards' decision, the 6-4 shooting guard canceled trips to Kansas and North Carolina, two schools among his final five along with Kentucky and Florida State. That’s not to say Edwards is another Magic Johnson. Who can be? But he can build a homegrown bond with his university that lasts long beyond his playing days. That’s what Johnson owns with Michigan State. Johnson's heart tugged at him to stay home, but he also had to learn to trust a new coach. He had looked forward to playing for former Michigan State coach Gus Ganakas, but he was fired after Magic's junior high school season. Ganakas told Johnson he could combine his heart with trusting his successor, Jud Heathcote. The rest of the world knows Johnson as “Magic” -- his mononymous person international identity – that was bestowed upon him through his Hollywood celebrity with the Los Angeles Lakers. But he leaves that behind on the Left Coast. His teammates still call him ‘E’ as they did in their college days. “Today just being ‘E’ is fantastic,” said Johnson in a media session prior to the Minnesota game and anniversary ceremonies. Johnson validated my belief he is one of a kind by more than showing up for the 40th anniversary. He long has been Michigan State’s First Fan, returning for regular-season games and traveling to NCAA tournament contests. He especially did so by where he sat and what he wore. Johnson wasn’t up in a private box, distancing himself from the fans and the public. He was one of the guys in the stands, sitting with his college teammates in a section behind the Michigan State bench. He wore the same head-to-toe green warm-up tops and sweats with a Spartan insignia blazed upon the heart issued for the reunion. On Friday night, he and the old-timers gathered for fun. On Saturday, they inspired the current players with encouragement and met their parents. He motivated Nick Ward and Cassius Winston, the team’s leading players. He spoke to the crowd during the halftime ceremonies while wearing a name tag that read “Earvin Johnson.” During that media, session, he told old stories, laughed and answered questions for 18 minutes. It wouldn’t be the same if Johnson had been lured away to Ann Arbor by Michigan’s brighter national spotlight at the time as the 1976 NCAA runner-up to Indiana. The same with picking a Kentucky or to a UCLA. At those places he’d still be a famous and revered figure that went onto become an NBA icon, but he’d also be in a college line with other legends before him. At Michigan State the line forms behind Johnson. And the line has grown, thanks in part to his stature. Michigan State has been to seven Final Fours and won the 2000 NCAA title under Tom Izzo. Johnson added Michigan State is not only special, it's not like this at other places. He's one of the reasons why. Johnson’s legacy also makes his connection to the university deeper than the basketball title. When he spoke to the Breslin crowd, he referred to the Larry Nassar scandal that erupted a year ago without mentioning it by name. That’s as old-school as it gets.